The kit is all about journalling, and will include journalling prompts, hints, tips and ideas to help you record your special memories. Looking forward to sharing the full reveal with you on the 1st! ...for sneak peeks of my February Kreative Kit. I was really quite nervous putting my kit together; that I'd get it and not be able to create anything with it. But having been busy with it for the last 3 weeks (hence quietness on here), I'm really pleased with how it's all coming together. I just hope others will enjoy creating with it. This photo was taken about an hour ago. It's mid January, in Tropical North Queensland, and I'm in winter pj bottoms, and socks (and a tshirt)... what the!! It's been raining all day, and instead of the usual make-you-even-muggier rain, it's a quite chilly rain. Perfect for a hot chocolate, reading the latest Creating Keepsakes magazine, and maybe a little scrapping later. I had every intention of posting timely seasons greetings, but time got away from me. I trust everyone had a lovely Christmas, and have a happy and healthy new year ahead. We had a lovely Christmas in Brisbane with the family. January 1st heralded not only a new year, but a new month of TSK inspiration. Check out the gallery. In the last few months, I have uploaded a handful of layouts to two peas. 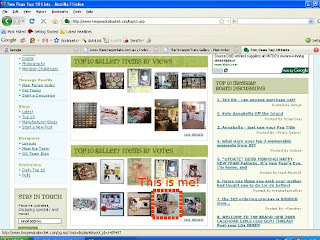 For those who don't know, two peas is about the biggest scrapbooking site/community online. 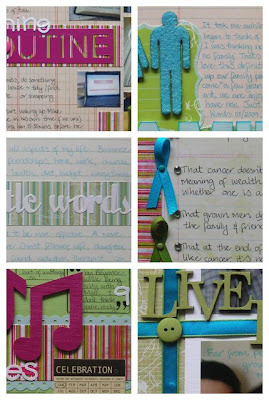 When I first got into scrapbooking (and still), I would spend hours on two peas, being inspired. To see one of my layouts in the top ten (be it ever so briefly, it was gone by Friday arvo) was a thrill.